I believe Dad liked Halloween as much as I did. He stayed out of the costume discussions, never shopped for Halloween treats, and never considered dressing in a costume himself. Still, he took us kids around to the neighbors; it was his idea to have a Halloween party when I was a little girl; and one year, when I was a not so little girl, he stayed at home and prepared for all the trick-or-treaters. Our house got just a few trick-or-treaters, ’cause it was in the middle of the mile and just a few houses were on that mile. That was a lot of walking for a few Squirrel Chews, Red-hots, Neccos, and jawbreakers. If Dad drove, I got to trick-or-treated for miles and miles. Of course, that could be trouble. Dad liked to visit more than anything, and he liked to go to everybody’s house, even really old people with no kids. Those kinds of people invited Dad for a cup of coffee and a visit, and he always said yes, which left me and Deanna and Bonita and Vickie just standing there on the front door rug and getting sweaty under our masks, waiting for the chatting to be over, trying to be polite, but having nothing to do but stare and wonder when the heck we would ever get out of there. Two old ladies who lived in a farmhouse all by themselves, forgot all about Halloween, so Dad sat around drinking coffee while those old maids popped corned for treats. I got the jimmy-legs standing around like that all still and quiet. Those kinds of people gave out stuff nobody wanted anyway, and nobody would trade for: popcorn balls, black licorice, apples, and maybe even a stupid penny that I had to save up until Sunday to use. Everybody should have a least one kid, just so they got a chance to understand what kids want, ’cause for some reason when people get all grown up, they forget all about kid-ness. Once I got a whole full-sized Hershey bar. That was from the house on the corner. They were rich people. I knew they were rich ’cause that house only had two perfect kids, one boy and one girl, with buttons on their shirts that all matched perfectly, no mis-matched substitutes when one button got split in two by the ironer or lost somewhere. The kids sat up on the couch or up on a chair, instead of on the floor to watch TV, and those kids never had a hole in their sock, either. I babysat for those kids when I was eleven and a big kid. They walked around the house in their stocking feet, instead of shoes, and their socks stayed pure white with no fuzz-balls or stains, like they just came out new from the package. Anybody who could get new socks that often must be rich. One Halloween Dad invited some of the neighbor kids and all my cousins to a Halloween party. That was the berries. Mom and Dad decorated with crêpe paper and black and orange paper chains. Mom hung lots of black thread in the doorway. In the dark, those threads felt like spider webs. That made my friend Daylene scream and claw at her face. Even I shuddered a tinsy bit ’cause I forgot the thread was there, and when I walked through, for just a second or two, I thought of spiders, too. Daylene got quite a chuckle out of me wiping at my face too. 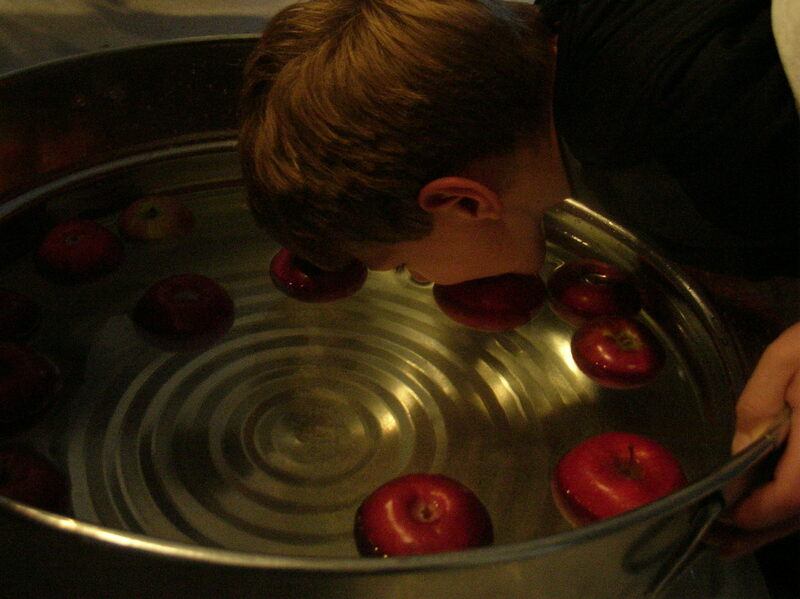 Dad put apples in a big tub for bobbing; it looked so easy, but turned out to be impossible. 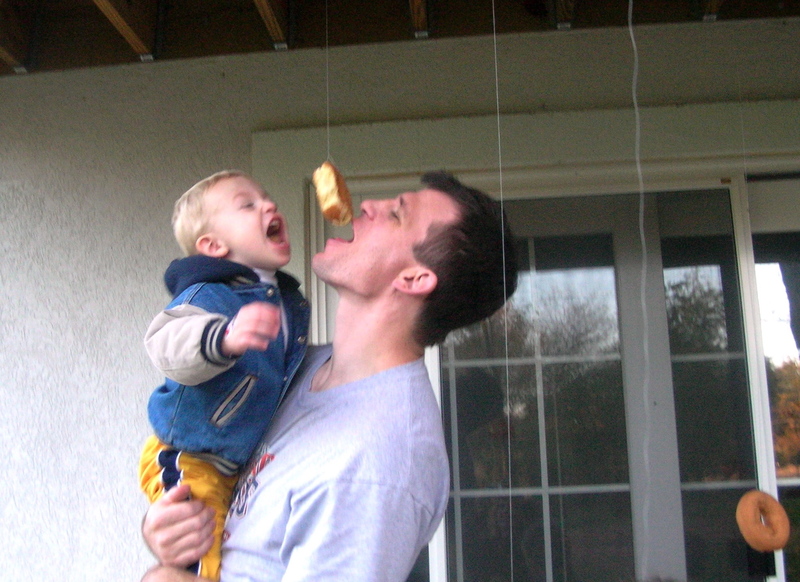 Mom tied donuts to a string. That was way easier, and better, ’cause I could get an apple any day, but donuts were hardly ever at my house. Donuts are the best washed down with a big glass of cider. I saw the bruised, almost rotten apples going through the cider press at the orchard. Dad said worms gave the cider flavor. “Extra protein,” Mom said. Mmmm, mmmm, nothing was better than fresh pressed cider. Dad got all excited one year, ’cause he planned a super spectacular surprise for all the trick-or-treaters. He built a big bonfire, and got a five-pound box of Koegel’s hotdogs, potato chips, cider. Enough for all the trick-or-treaters. Mom made her chocolate chip cookies and a big thermos of hot chocolate, ’cause that year was so cold, the sky spit bits of snow down. I was big enough to walk the little kids up and down the road, so Mom and Dad both stayed home. When I left him, Dad had the jimmy-leg himself, he looked so forward to seeing the faces on the surprised trick-or-treaters and their parents when came up to the house and spied the big Halloween feast and warm-up waiting for them. “Just a couple,” Dad said. His smile went up one side of his face and stuck there, just half-pasted on. The box of Koegel’s looked full. I just looked at Dad with nothing much to say with him still standing there with a hot dog fork in his hand. Today when I hear people talk about texting, e-mail, and the internet disconnecting people and creating an artificial sense of urgency, I think about Dad all those years ago, wishing people to just stop, enjoy a hot dog, a cup of hot chocolate, and a neighborly visit. 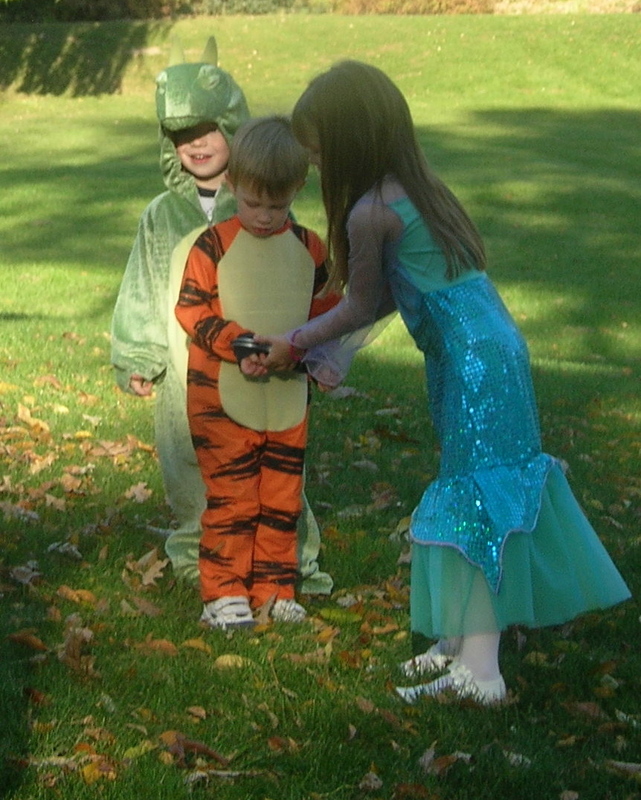 Several years ago I decided to have a ‘Nearly Halloween Party’ just so I could see all the grandkids’ costumes and spend some fun time with my favorite people. G-money and I spent the week decorating the inside and out for Halloween. Luminaries lined the walkway, with skulls, scarecrows, and dismembered body parts to put a scare into visitors. I made witches’ finger cookies, kitty litter cake, jello brains, and swamp-water punch. All the grandkids came over for what is now our traditional party: apple bobbing, treasure hunt, pinata, and fresh donuts on a string. A big bonfire did in the Christmas Tree we saved from last December just for this occasion. Everyone stayed until the very end, leaving me with a body aching to rest, and a full, happy heart.. The best part? The grandkids started ‘remember the year when…” Now, that’s the berries! That brought back memories! And I know what you mean when you say we are disconnected. People get together and talk on their cell phones or text message, there’s no connection with the people that are together. The year we went to Tenesee to work on HUD projects, we picked up two teenagers in Ann Arbor. We thought it would be a great opportunity to get to know them. They jumped in the car, put in their ear thing-a-ma-jigs and never said a word to each other or to us the whole trip. What a let down. Dad did have a gift for giving of his time and attention! The same as in your other story when he sat and had coffee with the two old childless women. We should all be so gifted. I’m going to practice!